Frank Wilson (1886 – 1970), Chief of the Secret Service from 1937 to 1946, decided to write his memoirs in the aftermath of the JFK assassination. They were published as Special Agent: A Quarter Century with the Treasury Department and the Secret Service (1965). Wilson wrote a draft of some chapters before enlisting a professional writer as a co-author. It was assumed that the drafts were used and destroyed as the published version was written. However, one draft chapter of material with no counterpart in the published book has surfaced. Given the continued secrecy surrounding the Office of Occult Affairs, the reason why this material was never used is self-evident from the contents. It is here published for the first time. 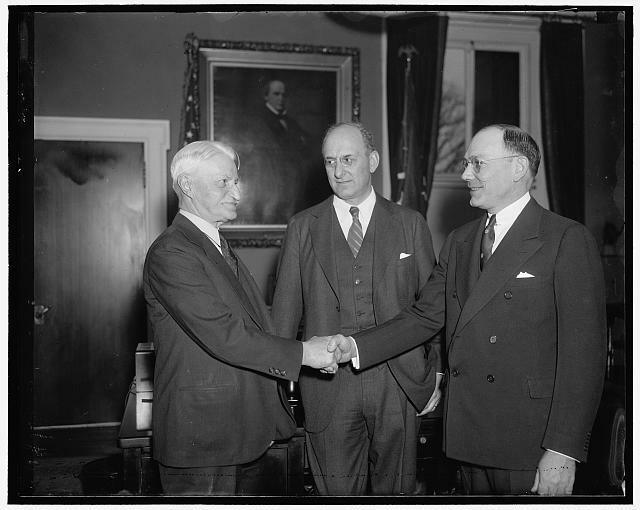 When I took over the United States Secret Service at the end of 1936, I spent some time with my predecessor, Chief William H. Moran, discussing the Service’s organization, goals, and practices. Moran was helpful in explaining the closed culture of the Service. To a new Chief like me, who was coming from outside the Service, this was an essential introduction. My puzzlement was obvious, because Moran launched into an explanation. In short, the Office of Occult Affairs was an organization of magicians that was under the Service but not part of it. There were agents who were magicians in the Office, and the head of the Office had traditionally been one of those. And there were women magicians. The Office had been around for decades, but had become so ineffective no one could say what they actually did. When the head of the Office in 1930 resigned, Moran couldn’t find anyone who was qualified to head it who was both an agent and a magician. Nor did any of the regular agents who were qualified want the job. Moran was about to shut down the Office when he agreed to hire a young woman named Priscilla Hughes as the new head. Hughes was not an agent, naturally, but she wasn’t a magician, either. Moran never offered an explanation of why he hired her. I met Priscilla for the first time a few days after I officially became chief at the beginning of 1937. I was booked for a meeting with a Mrs. Alvin Andrews, whose name was unfamiliar to me. When I questioned my secretary, I was informed this was the head of the Office of Occult Affairs. It turned out that Priscilla had married in 1935, and used her married name for most purposes, but was still known within the Office by her maiden name. My respect for Priscilla Andrews went up a notch with that statement. And the subsequent discussion raised it several more notches. Priscilla had modernized the Office in many ways that I was considering for the Service as a whole, and indicated her willingness to co-operate in sharing procedures. And, in truth, she did share a great deal of information. On the other hand, this co-operation almost never extended to implementing a common system across both organizations, a pattern I did not notice for some time. And that sums up my relationship with Priscilla Andrews and her Office of Occult Affairs. Despite having an independent relationship with Secretary Morgenthau and President Roosevelt, Priscilla was a loyal subordinate who almost never used her access to work around me. She was careful to file regular reports with me and co-ordinate her work with the other branches of the Service as needed. On the other hand, she could switch to being evasive, vague, and misleading when she felt it appropriate, and Priscilla alone determined when it was appropriate. It was hard to tell when she was being cooperative and when she was not. I found her unfathomable. And that was perhaps the most curious thing about Priscilla: she was not a magician, but she ran a group of magicians successfully. No one could explain why, not even Sylvia Thompson, her close friend and trusted subordinate. As Chief Moran has said, Sylvia Reynolds Thompson was “easy to spot.” She was an albino with wild white hair who stood six feet, three inches tall. She was intensely loyal to Priscilla, and a great favorite with the President when she was on duty at the White House. Like her boss, she could be inscrutable at times, but she was genuinely one of the nicest people I have ever met, and did her best to explain the Office’s magic to me. More mysterious was Priscilla’s “left hand man” as she sometimes called him, the magician who went by the name of “Brandywine.” He was a wild man even by the Office’s standards, eccentric, unpredictable, and yet reliable when it came to getting his work done. Priscilla was very reticent about explaining what Brandywine did, telling to me that he handled those assignments in which the Federal Government would not want its involvement known. Ultimately, Brandywine would be killed by the Nazis in 1942 on an undercover assignment in Europe. Brandywine’s successor was William Harmon. Harmon was a marked contrast to his predecessor. He was a magician, but he had no air of mystery about him. Instead he was a disciplined and affable individual. I soon grew to like him, and relied on him to help me understand at least some of what was going on in the Office. When Priscilla retired in 1945, I was happy to agree with her recommendation and appoint Bill as her successor. My one major dispute with Priscilla was in early 1942. In the wake of our entry into the Second World War after Pearl Harbor, I was tightening up security at the White House, and across the District of Columbia generally. The Office of Occult Affairs had received information that an important Nazi magician had come to the United States, and was planning to assassinate our political leadership, or bend them to his will. Priscilla was very uncommunicative about how she planned to deal with this threat, and what she would tell me seemed inadequate to the threat. Meanwhile, the Federal Bureau of Investigation’s director, J. Edgar Hoover, began a push to have Priscilla removed and the Office transferred to the FBI. Hoover alleged that Priscilla, who was nursing her third child (born on December 7, 1941), was unfit as a wartime leader and that all intelligence-gathering functions should be consolidated under the FBI. I was becoming so frustrated with Priscilla’s lack of cooperation, and went so far as to complain to Secretary Morgenthau that we should either replace Priscilla or turn her and the Office over to Hoover. Knowing that the President liked Priscilla Andrews, Morgenthau asked me to hold off until he had spoken with the President. A few days later, a visibly irritated Treasury Secretary summoned me to his office, and made it clear that nothing would be done about Priscilla until the fall. As I later found out, Priscilla had set a trap for the Nazi magician that depended on absolute secrecy. She had told the President and her magician Sylvia Thompson, but no one else. The trap worked and the Nazi magician was killed. Priscilla came to my office a few days later to explain and apologize for the misunderstandings. When the President subsequently promoted her and gave her the title of Director, he offered her the opportunity to separate the Office from the Secret Service. She declined, stating she would rather continue working within the Service and with me. Thereafter, we had only minor misunderstandings. This entry was posted in Dragon Lady, History, Writing fiction and tagged Fiction, Magic, memoir, Secret Service, united states secret service, Writing. Bookmark the permalink. It is easier to apologize afterward than to get permission in advance. Silly would agree, so far as her own conduct was concerned. Indeed, she once threatened to attack a foreign embassy in Washington with her magicians, without so much as even informing the Departments of State and War. Morgenthau was not pleased, after the fact, but what could he do?